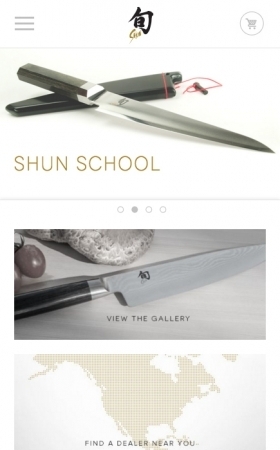 Shun Cutlery needed a website that not only showcased the elegance and custom craftsmanship of their knives, but finally allowed customers to order them online. 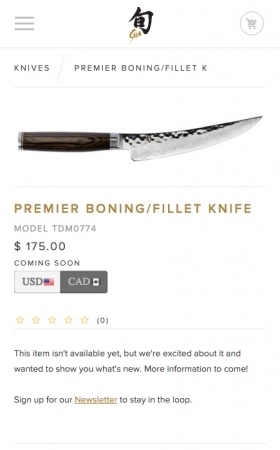 Additionally, Kai wanted to build a robust web presence that tied all its knife brands (Shun Cutlery, Kershaw Knives, Zero Tolerance, and Housewares) together to encourage cross-purchasing between brands from loyal customers. Shun Cutlery takes pride in the handcrafted perfection of their knives. Their website is a direct evolution of this idea; a perfectly responsive, gorgeously designed website that pushes the boundaries of what an ecommerce website is. 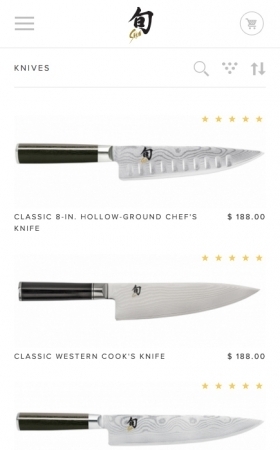 Customers are drawn to the Shun Cutlery website with its creative functionality married with elegant design; the filtering of the product gallery in particular makes the shopping experience simple and engaging. The ultimate, satisfying design is nearly tactile in nature. In order to create a cohesive design between the Kai brands, we created a comprehensive style guide for each. The new Shun Cutlery site takes advantage of the beauty of the knives and uses a lighter color palate so as not to compliment the craftsmanship of the knife. This color scheme plays well with the overarching Kai brand and design aesthetic for the other Kai sites, while still standing on its own. Like what we did for Shun Cutlery?